I was extremely happy to come across Imprint® Custom Mats. The company sells professional grade comfort mats for the home and office setting. A few years back, my father slipped and fractured his hip in the kitchen. I was startled to see how a hip fracture can lead to a rapid decline in health. After the break, I set out on a quest to find a high quality padded mat for the kitchen. I hoped to find online stores selling the professional grade mats found on floors of offices and stores. I finally settled for a memory foam mat from a discount outlet. The cheap mat has already lost its fluff. 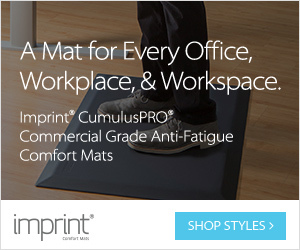 Imprint® Custom Mats of Scottsdale is bringing professional grade mats to the home. I bought the 72" by 26" runner as it covers most of the kitchen area. I should also note, that the runner is a perfect size for a camping mat. Of course, the standard sizes are perfect for work areas. Doctors have been warning that sitting all day is bad for our health. Smart homes and offices have taken to creating standing work spaces. The standard mats are ideal addition for such standing workstations. The company started an affiliate program with Avantlink in April 2017. I might receive a commission on sales made through links on this page.